Science and technology, taken expansively, have affected almost every aspect of human existence in developed countries. What are some of the ways that this manifests? Consider a popular doomsday scenario: EMP, or electro-magnetic pulse. Popular fiction like “72 Days in September” uses EMP as a plot device to consider how society responds to the removal of most technological infrastructure from the USA. What knowledge is needed to comprehend the concept? What infrastructure is needed to ensure that the concept is passed on? What infrastructure is needed to actually implement the concept? Does the concept implementation’s benefits justify the effort? One of the things that we will be considering over the rest of the course is a rejection of scientific findings. The term denialism covers this well for many familiar topics. Perhaps the archetype of denial would be that of dismissing the health concerns raised by use of tobacco products. Modern effects trace back to research by Richard Doll in 1952 showing evidence of harmful effects of tobacco use. The corporations manufacturing and marketing tobacco products engaged in highly effective forms of denial of that and further research. and other tactics. Many of the same tactics used by the tobacco industry in response to health research can be seen in other denialist reactions to scientific research. There are a number of ways that lay people are currently contributing to scientific effort. Science and technology is also used to destroy, and history shows the increasing efficiency of weaponry from stone tools to the potential “doomsday” weapons of mass destruction. Conflict between human groups often plays out as a contest between different levels of technology. Here’s an exercise: figure out various advances in science and technology, and whether we can call them beneficial or detrimental. A major role for science and technology lies in promoting health and overcoming illness. In recent times, the increased effectiveness of medical science has actually shifted both human lifespans and causes of death. All of these changes have follow-on effects for our society. Increasing lifespans bring with them concerns on how a burgeoning elderly demographic either supports itself or is supported by society. Here in the USA, the way Social Security is structured is causing a lot of political maneuvering over its continued funding. Another major economic and political concern is how to provide medical services. The USA stands out among industrialized nations for how expensive medical care is and how poor the outcomes are relative to other such nations. A number of issues related to health can be identified as of current interest. An anti-vaccination movement denies the effectiveness and safety of vaccines, leading to a resurgence in cases of previously well-controlled communicable diseases. Overuse of antibiotics threatens the emergence of new communicable diseases that may prove difficult to treat. Some things now indicate that the future could be very different. Science and technology brings change, and another word for change is “disruption”. Society has had to deal with these changes. Currently, the pace of change seems to be higher than what has gone before. The development and spread of agriculture changed the division of labor. In the modern era, technology has been replacing human effort. What happens when most prior jobs are invalidated? If the jobs don’t exist, it no longer is a matter of what the wage ought to be. capacity” of the human population, and what this means going forward. What happens if the current human population is deprived of science and technology? What happens if science and technology does not advance fast enough to meet today’s challenges? Philosophers have argued about defining science for centuries. We are not going to resolve that here, but hopefully we can make some useful distinctions. There are a couple of ways that people often talk about what makes something science. One is distinguishing what topics science can handle. The other is the process that is used to direct inquiry. The second idea can actually mostly determine the content of the first; that is, how we do science will set out what things we can do science on. While what we now know as science is well-specified, this is a pretty recent phenomenon. We can look back over history and recognize efforts that, while not conforming to modern scientific practice, certainly share many of the elements of science that we see today. 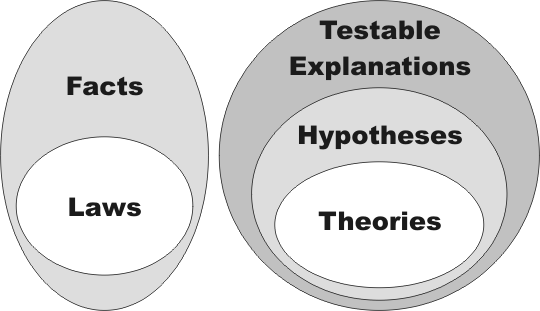 Here’s something I use to conceptualize the relations between facts, laws, and theories. The upshot of this is that laws tell us about regularities, and theories explain why those regularities exist. There isn’t one unitary approach to doing science, but the Wikipedia article does condense a pretty standard way to think about how science gets done now. Having a method helps avoid pitfalls that experience tells us are bad for us. Previous generations of humans haven’t had the modern, codified scientific method to draw upon, but they still figured things out and made sure that the knowledge got passed down. Agriculture is one of the most significant technological advances made by early humans. Hunter-gatherer society and tool use in support of that lifestyle had to change to accommodate the ability to actually plan and grow plant foodstuffs. What changes can you think of that would be necessary to go from hunter-gatherer society to an agricultural society? What does agriculture imply for the number of people that can be supported by an area? Monuments and structures raised by ancient peoples often incorporated features that related to determining celestial events. In 1901, divers recovered materials from a wreck near Antikythera. Among them was a corroded, encrusted mass of bronze that has since become known as the Antikythera Mechanism. Article on researcher setting the date of the Antikythera Mechanism earlier. Assumption: “start date” relates to earliest predicted solar eclipse. To really get a handle on what the relationship between science and society implies, one needs to understand how populations change over time. Can Science Fandom Hurt Science?